Father’s Day is around the corner, and just in case you have long run out of ideas as to what to get for dad other than the usual (and boring) items like a tie or pair of socks, here is an unusual take on the very ordinary necktie. I am referring to this $29.99 Laser-Guided Tactical Necktie, where this particular piece of boardroom fashion is able to spruce up them boring meetings. With it, your presentations will never be the same again, this I can assure you, and who knows, it might actually prove to be the winning factor or edge when you want to nab that contract from the nose of your bidding rivals. Of course, during the leaner months at the office where contracts are pretty hard to come by, there is still a place for the Laser-Guided Tactical Necktie – as you can always send that laser dot all over the place to make the resident office cat go nuts as it makes a futile attempt to chase down a laser dot that seemingly has a mind of its own. 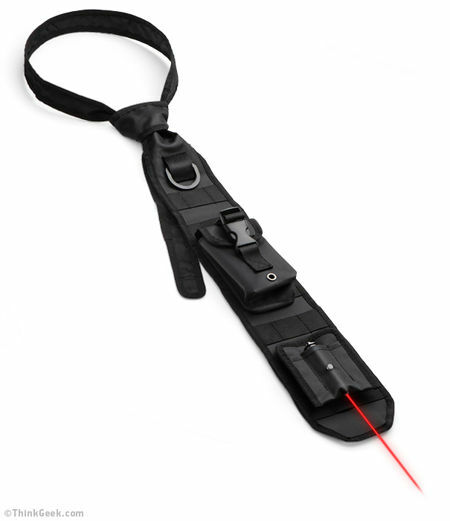 The Laser-Guided Tactical Necktie is a laser pointer with a difference, thanks to the integrated Class II laser which is powered by a trio of LR44 button batteries.